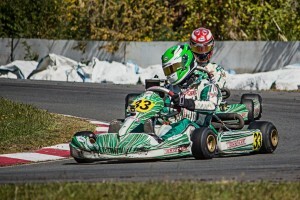 A canny combination of speed and consistency gave Taranaki racer Brad Still the edge in the 125cc Rotax Max Light class at the opening round of the new-look Bayleys WPKA Goldstar kart series in Wellington over the weekend. Rotax Max Light was the class field of the day with recent South Island champion Chris Cox coming over the water to test his mettle with series regulars Brad Still, Michael McCulloch (just up from Juniors) and Jack Bridgman. Still’s consistency with three second place finishes before going one better in the fourth and fifth heats saw him take the round win from Michael McCulloch and third place getter John Wallace – Cox eventually finishing fourth. Promising performances were also seen from local drivers, and recent entrants to the class, Zach Thompson and Ashleigh Stewart. In the other Senior Rotax class, 125cc Rotax Max Heavy, another recently crowned South Island champion, Jordan McDonnell from Christchurch, faced off against top North Island-based drivers Zach Zaloum and Aaron de Ridder. McDonnell took out the fifth heat from de Ridder and Melhop to win the day, with Zaloum losing a chain on the last lap while in second place. A good sprinkling of masters drivers made for great ‘youth versus experience’ racing, with youth eventually coming out on top! Wellington’s Brent Melhop led the masters’ contingent home followed closely by Karl Cameron and Quin Clark. Quin might be looking to reverse the order next round at his home track of Manawatu. Masters drivers also featured in the Clubsport 120 class which saw early wins going to Simon Frater, with Brent Robinson and long-time competitor John Paddy chipping in as the day went on. Racing was tight with eventual winner Frater leading home the two masters entries of Robinson and Paddy. Class competitor Jim Thompson’s day was kick started at drivers’ briefing, meanwhile, when he won a set of new slicks courtesy of MG Tires. In the Junior ranks Junior Rotax racers Dylan Drysdale and Jacob Cranston shared the early heat wins with Dylan taking out the 5th heat. Maddy Stewart and Kaleb Ngatoa were pushed hard all day by class debutants Rianna O’Meara-Hunt, Josh Donohue and Lee Zeltwanger, the latter rewarded for the travel from Auckland with a great third place finish for the day. A dominant day for Manawatu driver Bailey Walker in the Junior Yamaha class saw him take out every heat from a fast finishing Ronan Murphy, son of V8 Supercar and Super Tourer ace Greg Murphy. The day kicked off with Cadet ROK racing, the top three spots in the majority of races being shared amongst South Island visitors William Exton, Louis Sharp and Zac Christensen – a great reward for crossing Cook Strait to compete in this series. 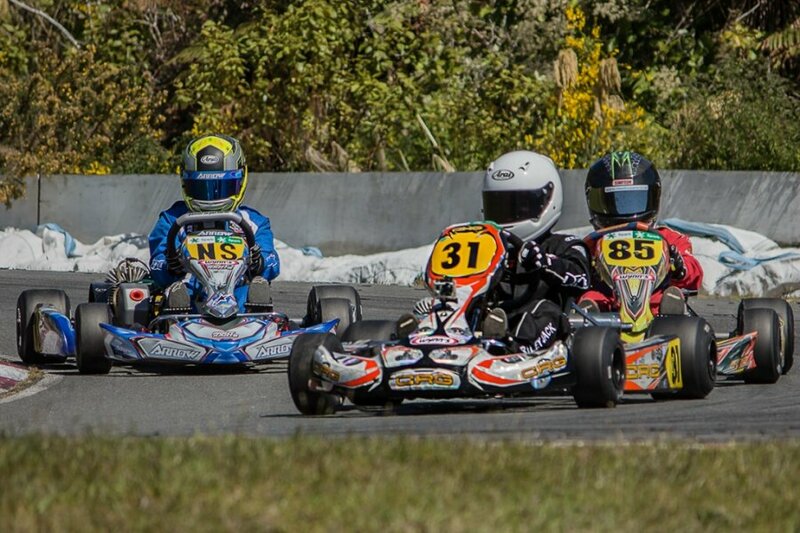 Racing was equally as competitive in the Vortex Mini ROK class with Ryan Wood on his home track after his recent return from racing in Italy, Louis Redshaw and Riley Jack all having heat wins. Jackson Rooney in his first Mini ROK start after moving up from the Cadets also fought hard all day with Sam Wright and others. Winner for the day was Riley Jack – a great start to his series. As part of the prize giving the Official Supplier and Round Sponsor, Sparkarts presented the HiPrema Air Gauge to Robert Burrows – a great prize indeed. Spot prizes were also supplied by ORG, Dulux and Wynns. 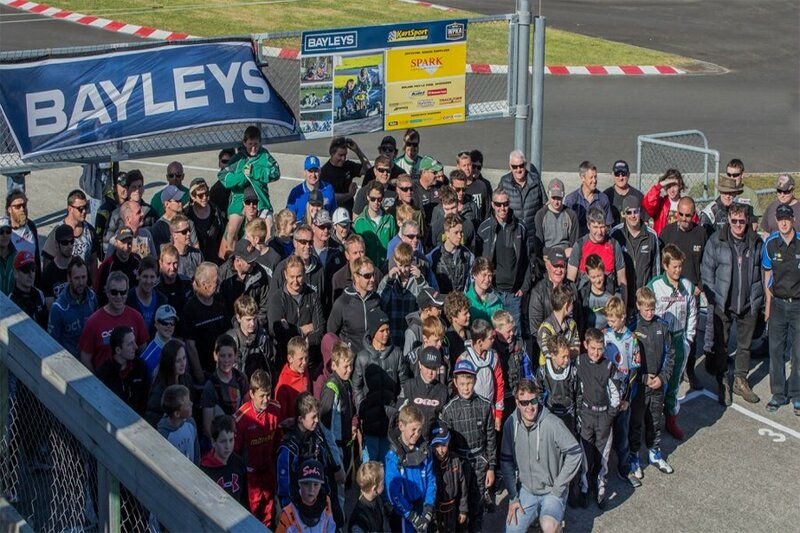 The Sparkarts-backed opening round of the new-look 2014-2015 Bayleys WPKA Goldstar Series was held in hot, sunny conditions and attracted 85 competitors spread over seven classes. The series now heads north for the second round at KartSport Manawatu’s Manawatu Toyota Raceway in Palmerston North in early December. 1.Bayley Walker; 2. Ronan Murphy; 3. Robbie Johnson; 4. Jayden Smith; 5. Nathan Cox. 1. William Exton; 2. Zac Christensen; 3. Daniel Austin; 4. Tony Smale; 5. Logan Manson; 6. Jenson Bate. 1. Simon Frater; 2. Brent Robinson (M); 3. John Paddy (M); 4. Braden Parsons; 5. Jim Thompson (M); 6. Kevin Groves. 1. Dylan Drysdale; 2. Jacob Cranston; 3. Lee Zeltwanger; 4. Joshua Donohue; 5. Maddy Stewart; 6. Kaleb Ngatoa. 1. Dylan Drysdale; 2. Joshua Donohue; 3. Jacob Cranston; 4. Nick Evans; 5. Maddy Stewart; 6. Rianna O’Meara-Hunt. 1. Jordan McDonnell; 2. Zach Zaloum; 3. Aaron de Ridder; 4. Brent Melhop (M); 5. Karl Cameron (M); 6. Quin Clark (M). 1. Brad Still; 2. Michael McCulloch; 3. John Wallace; 4. Chris Cox; 5. Jack Bridgman; 6. Zachary Thompson. 1. Brad Still; 2. John Wallace; 3. James Higgins; 4. Ashleigh Stewart; 5. Jonathan Dwyer; 6. Zachary Thompson. 1. Riley Jack; 2. Ryan Wood; 3. Louis Redshaw; 4. Tom Greig; 5. Jackson Rooney; 6. Ethan Donohue. 1. Ryan Wood; 2. Tom Greig; 3. Ethan Donohue; 4. Jackson Rooney; 5. Riley Jack; 6. Sam Wright.